Treb's Blog Stop: Good News! ~or~ Why Don't Kids Listen Anymore? A couple of days ago I was able to fit into the lapbar on Space Mountain at Disneyland. Yea! That was one of my goals when I started to lose weight. The only thing wrong with that is, I didn't fit so well. When I pulled the lapbar back my legs were in the wrong position and I was only able to get the LAPbar over my knee caps. I yelled back to the girl running the machine that I needed her to unlock my bar and either let me get in position or let me off. I actually started to stand up to get her to notice me. I guess with all of the commotion and noise she didn't hear me or Steve whistling, or wasn't paying attention and launched the coaster. So my first ride on Space Mountain at Disneyland was without benefit of lapbar. In the picture notice my smile? The ride was over, and... well yeah, I did have fun. Nothing says thrill ride like potential death, and it wasn't so bad that I would get thrown out. Once the coaster was moving I figured “what the hell, might as well enjoy it”. 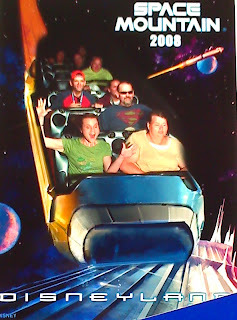 On following Space Mountain adventures I was able to do it right. OK Walt... That's twice you've done that to me.